Suitable for individual kids aged 8 or over. Tuition is given in small groups with a maximum ratio of six kids per instructor. 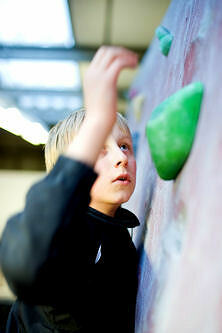 Kids are taught how to climb and look after themselves and others in an exciting, energetic environment. Sessions run every Saturday and Sunday morning (from 10am -12pm) or afternoon (from 1pm-3pm). These are usually extremely popular so please book well in advance to avoid the chance of your child being disappointed at the last minute. All children who wish to attend our kids club must initially complete our 4 week introduction to kids club sessions. To save time on arrival please download, print out and fill in a Parental consent form. 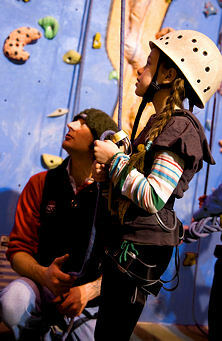 Introduction to kids club is £67.50, to cover the first 4 session introductory course this includes a one off additional cost of registration in the National indoor climbing achievement scheme NICAS and all equipment. Thereafter the cost per session will be as follows. £15.00 including all equipment if required. £10 If child has full annual Membership. 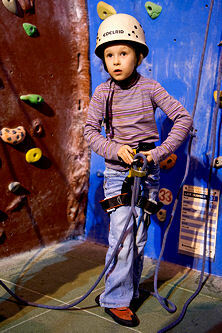 which is an easy to use website for finding places to visit with your family all over the UK. Searchable by age of kids, county, town, postcode and indoor or outdoor attraction.